Be sure to sign up for update alerts! If you'd like to be notified of AQT updates without being notified about conversations at the main thread, follow this topic by marking it as "Watching" at the bottom of this page. 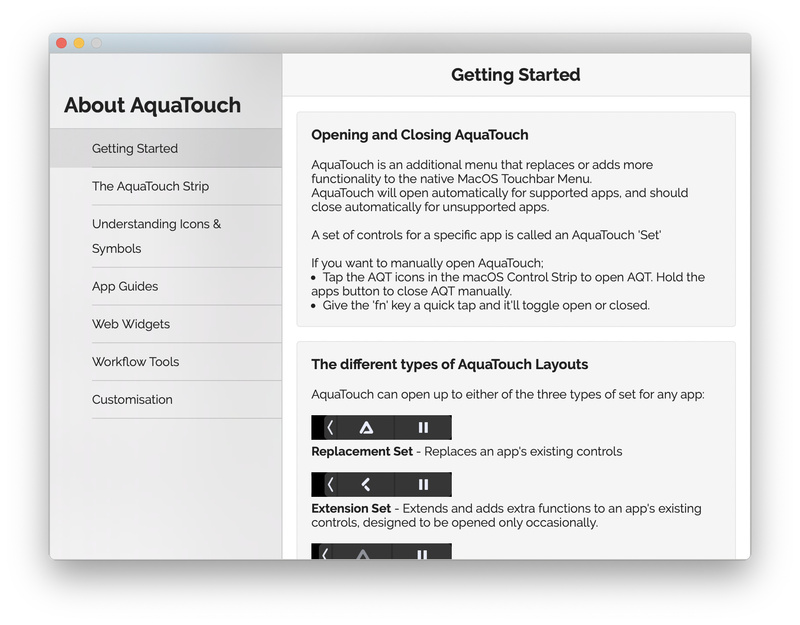 You'll be sent an email (the one you used signing up to this forum) when a new AquaTouch update is available. This update requires you to update to BTT v2.724 if you haven't already! Download and install the BetterTouchTool App if you haven't already. Make sure you have at least v2.724. Download and import all assets listed below. 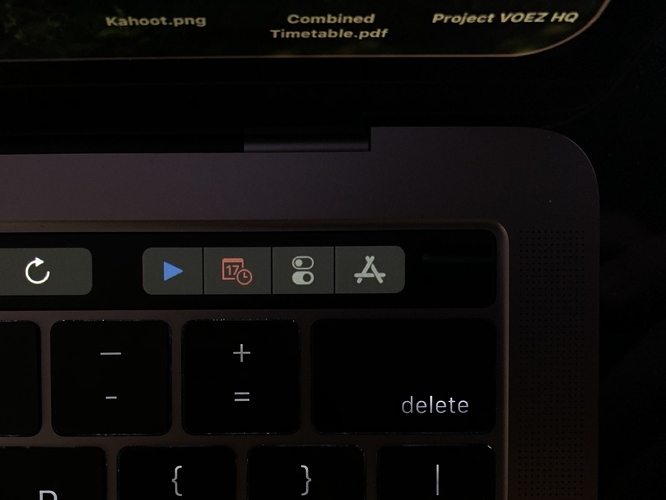 Open up the BetterTouchTool window, you should see "Welcome to AquaTouch" in the Touch Bar. Slide to the left and tap "Setup Instructions". Follow the on-screen setup instructions. Note that a limitation of gestures requires you to open the BTT bar if it is not open before you swipe. To change the volume, open the BTT bar, then swipe. On applications that aren't supported by AQT, a gesture bar appears. You can swipe as usual on it but you can also quickly close the AQT bar by tapping it so you can continue to use the native buttons. If you have any issues, feedback or questions, feel free to give me a comment! I feel that the “extension set” and “full set” terminology is kind of confusing people here in this forum, so I’ve decided to name them “extension set” and “replacement Set” now. b0.0.0 - indicates that it is a beta. Betas are stable enough to be used daily but may have some small bugs and incomlpete details that might not work. v0.0.0 - indicates a complete (afaik) build, with no work-in-progress features. X.0.0 - indicates a major redesign in the way AQT works. 0.0.X - indicates a bugfix/hotfix release that fixes reported bugs. Share song with “song.link” service so that your friends can listen anywhere! Updates to the tools you had. 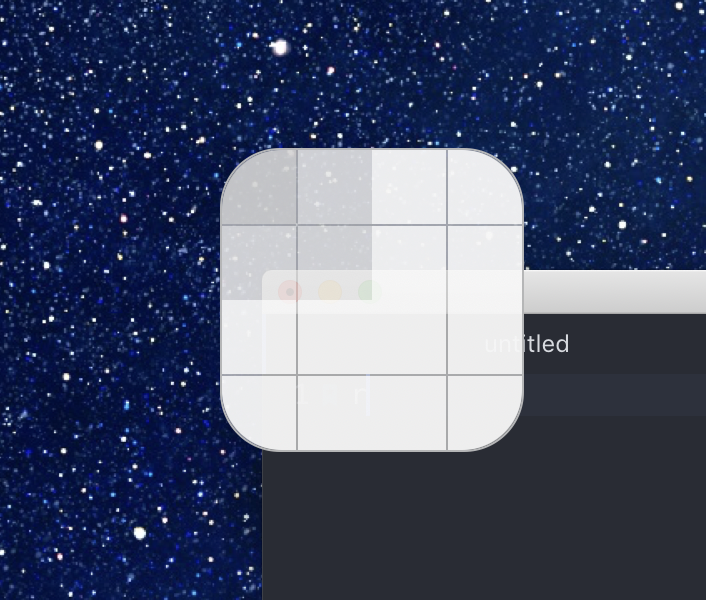 “Show in Finder” button added and layout improvements. I don’t use outlook all that much so please get back to me about how well it works! New GMail Widget inspired by @Franklins! Read and Compose modes keep the bar neat while allowing more functions. New File at current location: Currently supports making a new text file, or a new VS Studio Code file. Displays to the left of the control strip while open for you to easily toggle your devices. A replacement set for the Script Editor. Export and Print Options in the TouchBar. All old AQT control strips should now be updated to the new one. Yes, they were a mess. They are now merged into the CS and I’m not sure about it, so give me some feedback about this! Seems to work well for me as I used it. I can’t think of a better way as of now. They should update to your preference properly now. Should now more stably show for global non-iTunes apps. I needed a now playing widget in there for it to work properly, so i added it though it’s invisible. There is now an indicator on the control button that tells you if Do not Disturb is turned on. It didn’t follow the ‘on calendar / on reminder’ options before, now it does. Are now in a seperate Conditional Activation Group for easier tweaking, and to easily make them show in more places with the introduction of stuff like the ‘mini control strip’ or ‘web widget control strip’ in some places. It now completely turns haptics on/off, including BTT’s haptic settings. This requires a quick restart so you’ll be notified of this. Startup has been made less gimmicky, as the notification badges while loading have been refined and neatened up. Added information about new features in a new layout. I'm learning how to HTML from this! Relevant variables are now automatically setup! No more clicking every setting. This update requires you to update to BTT v2.667 if you haven't already. Battery drain observed in this version! Warning: It has been observed from other users that this version has a more significant battery drain than previous versions. This may be because it's using BTT's very new and fresh alpha features which may not be stable yet. On my side, BTT has been observed to be hovering between 2-6% cpu usage, spiking to 10% when opening a heavy group. It's not a constant high drain, just occasional 3-minute spikes of increased activity, usually only when the AQT control strip is being interacted with actively. If battery usage is a major concern for you, then I suggest you stay/download b3.0.2 (below) instead. You'll still get most of the features, this latest version (b3.3.x) is mostly a refinement release switching to BTT's alpha builds for it's new features that fix many AQT cosmetic bugs. Download and install all assets listed above. IMPORTANT: Head to the AQT settings next to the Setup button (in the TouchBar when the BetterTouchTool is open) and tap every setting on and off. You need to do this to set all the variables within AQT to make it work! This step will be automatic in the future but it isn't at the moment. This preset is designed to be used with only two buttons in the control strip, the BTT button, and another button of your choice. For me, this is BTT button and media Play button. It's optimal if you remove all but one button from your control strip in the system settings, as volume and brightness can be controlled using gestures. Fixed ‘Nothing Playing’ message displaying when a Netflix video is running. • also made it show a loading when it’s loading. Safari Widgets don’t open the Safari AQT Bar automatically now. It was kind of annoying. • Improve the skip ad button. You need to enable youtube ad tracking for this to work for now. Still much room for improvement. Added Missing Haptics to my secret developer tools in the welcome screen. Can you find them? • @Dom Escape keys in the CS will be fixed soon. I plan to redo how it updates it’s look. • plan to integrate the skip ad function into youtube’s now playing widget once I get the good version working. • Smooth Updating is coming soon. Not much new features, but AQT is now MUCH more smoother to operate. I collaborated and discussed various BTT features and refinements with @Andreas_Hegenberg, funnily enough; to get BTT to support AQT. Though there might still be some bugs with the new feature, I can definitley say that AQT is way more fluid and stable due to his new changes. Head to the 'Quality Improvements' to see a list of these improvements. AQT Version Naming Scheme Changed. b0.0.0 - indicates that it is a beta. Betas are stable enough to be used daily but may have some bugs and incomlpete features that might not work. It’s the cutting edge version that is quite experimental. v0.0.0 indicates a final stable (afaik) build. Calling All Users! I don’t have a netflix so I need some feedback on it’s performance. 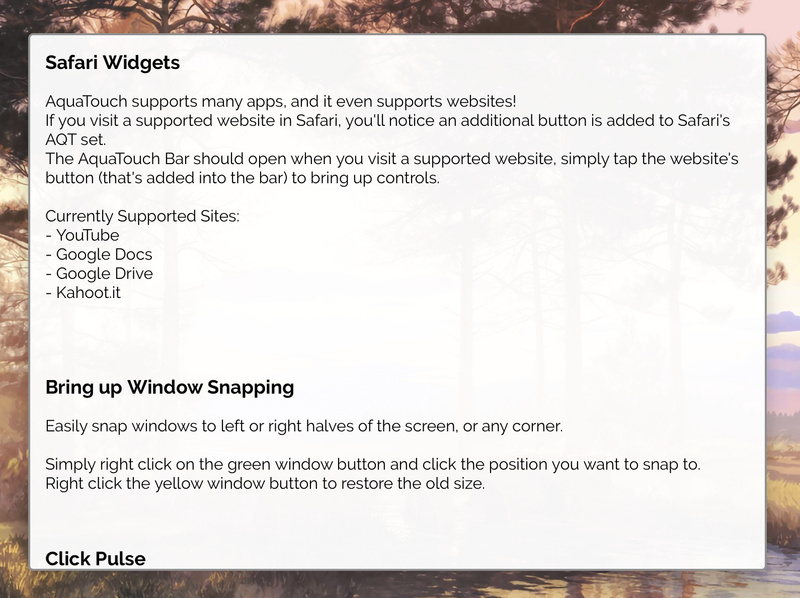 ‘Window’ button with: Bookmark, Downloads, History, Reopen Last Closed and Home. Refined the ‘close btt bar’ cosmetics for extension sets. Notification Badges, Control Strip and Escape keys shouldn’t get misplaced anymore with the addition of BTT's new 'Display Order' function. Control Strip Highlighting is now visible when the CS is open. Escape keys in the CS will be fixed soon. I plan to redo how it updates it’s look. Smooth Updating is coming soon. Keep Striving ON - AquaTouch b3.0.2! • tap EVERY option in the settings on and off. This will set various variables required to ensure the new scripted triggers work properly with the new settings view. I'm working on a smoother update experience, so hang on for that. The implementation of the settings and conversion of many triggers into applescript widgets may increase processor stress / battery drain. This is a beta and i'll need feedback about this to ensure that it's tamed enough for the full release. The version number now has a 'b' in front of it rather than a 'v' to indicate that this is a beta. Information about the operation of AQT3’s new functionality has been added. Tab/Navigation controls by @onaforeignshore! (he sent me a PM full of cool new changes. Looking into them for AQT b3.0.3. Control Strip Highlighting now applies while CS is open. 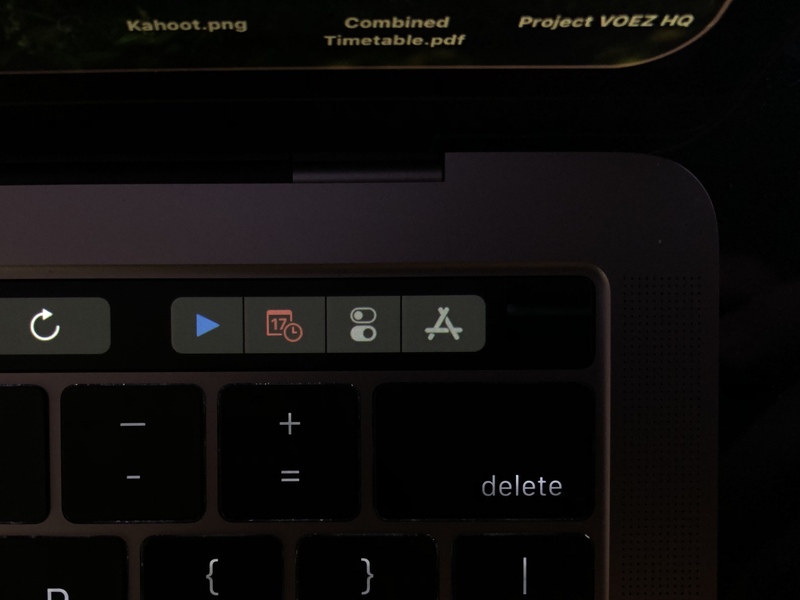 Added more Finder Quick Actions (it’s an extension set - so it will encourage you to use the native Finder TouchBar. New ‘Haptics’ toggle in the Control view to easily disable gesture Haptics when you’re in a quiet area. Here we are with another update! I've just been tweaking around whenever an idea popped into my head and I don't remember all of them, but here are all the changes I could remember. NOTE: You must be familiar with Aqua-Touch before you use this. The setup process is still not updated fully to help you through setup, so you should use v2 for a while if you haven't used it before. Intuitive PasteCells let you quickly keep and insert text. 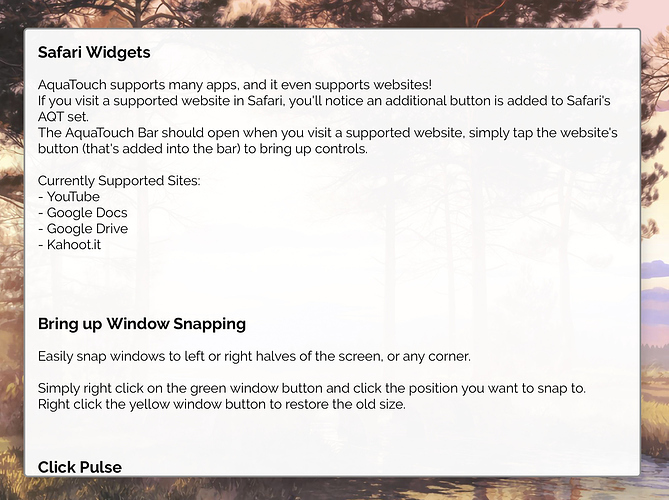 Safari Widgets - Touch Bar for Websites! If one of the supported sites are open, you'll see an extra button in the safari touch bar. Thanks to @panda's "Visual Window Snapping" preset edited by @Jerosh! You've been quoted within the code. Permission pending though, so it may be removed if upon request. * You may see some work-in-progress things here and there. * Help windows have not been updated for the new features of AQT3. You might be left confused about some features with no tips. Thanks to vipersonic's cool little VLC and Discord set for VLC and Discord! I did change the measured CPU core, and that may differ for your computer so a bug here may occur. ─ Improvements to connectivity options. Mute microphone, Do Not Disturb and Dark Theme toggles added. ─ New (experimental) handling of Adobe apps that should activate on all versions. ─ I got Spotify (sigh) just to see and improve the Spotify widget. Appreciate it! Like iTunes, the play button within the Spotify widget now controls Spotify directly and does not confuse with other media players. *─ Auto-Setup button has been polished and does it’s job smoother. It’s notifications and restart now work properly. ─ Various other small visual and stability improvements, bug fixes. Known Issue: The preset may be stuck with a 'Don't hold the BTT button again' message on import, which renders it unusable. Use the non-broken links to avoid this issue. Download and install all assets listed below.